This was a spur-of-the-moment recipe to try something completely different. 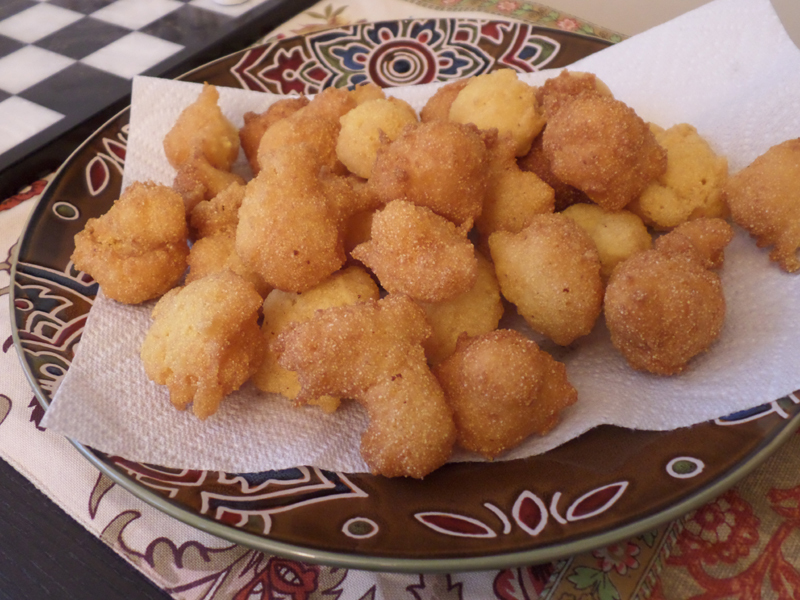 It was really the best hush puppies we’ve had, even beats Long John Silver’s when we used to go there. We haven’t gone there in many, many years as it’s a very unhealthy restaurant and we don’t like going to places where you have no idea how many times they’ve reused the oil or what other foods were in that oil. We like to be in control of our frying, during the rare times we fry. Our 7-year old liked them! They are fun and quick to make. We used a Dutch oven and it was really convenient and easy. We did not have to have the oil at that high of temperature (365°). Perfect texture and softness inside, and crispness outside. Enjoy! *Onion can flare some patients, so please first know if you should use it or not. In a large bowl, combine the cornmeal, flour, baking powder and salt. Whisk the egg, milk and onion in a separate bowl; add to dry ingredients just until combined. In a deep-fat fryer or electric skillet, heat oil to 365°. Drop batter by teaspoonfuls into oil. Fry 2 to 2-1/2 minutes or until golden brown. Drain on paper towels. Serve warm. Yield: 4-6 servings. So far, this is my favorite chili on the planet. Nothing in a restaurant and nothing I’ve made in the past compares to this. We both love it. It’s a take on Lonestar restaurant’s recipe. You can saute real onion and garlic but you don’t have to. I came up with the idea to add a red bell pepper as I had it in my fridge one day. Optional Final Toppings: grated cheddar cheese, croutons, oyster crackers, bread, sour cream, etc. **Known IC irritants. Tread carefully! Brown beef in a large saucepan over medium heat, drain fat. Add onion and garlic powder, cook one minute. 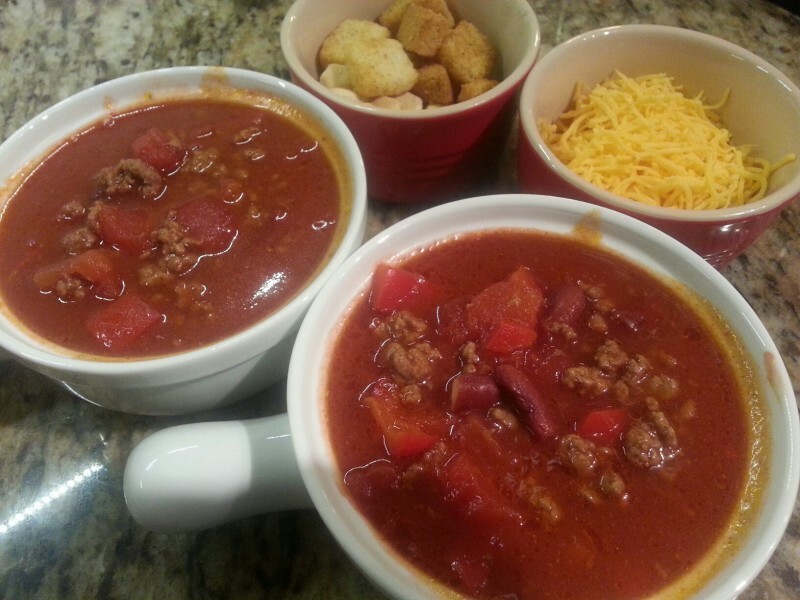 Remove beef to side plate or add to your main soup pot you plan on cooking in. (OPTIONAL) Leave some residual beef fat, or add olive oil to pan, and saute your red bell pepper, if using. Add remaining ingredients to your soup pot (excluding the last line: cheese, croutons etc) and simmer for 1 hour, stirring occasionally. I cover it 90% with a lid to keep evaporation down. When I’m done with school, I will definitely be creating more of my own recipes and recipes that are more advanced than this. This was a simple creation of using what I had left in the fridge: salsa, chicken, left-over rice. With my not-so-slow cooker, it took about 2.5-3 hours on low. Your results may vary. You can easily scale this recipe up. Sprinkle cumin and black pepper evenly across chicken. Pour salsa over chicken. Cook on low until pretty cooked. Scrape off salsa and remove chicken to a cutting board. Chop into bite size pieces. (I wanted to shred the chicken but it was not willing at this point). 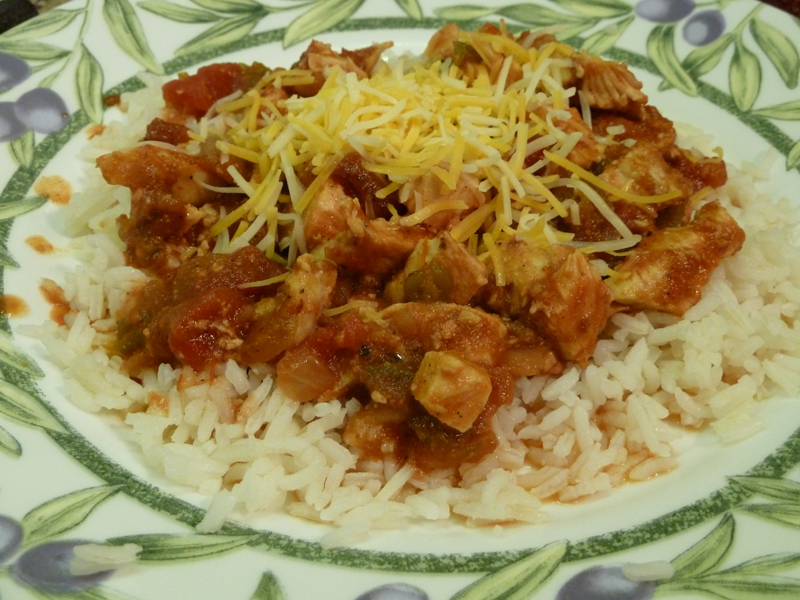 Return chopped chicken to slow cooker. Prepare your rice before chicken is complete. Continue cooking in your slow cooker until the chicken registers 165-170°, or as you prefer. Place rice on place, scoop chicken and sauce mixture and pour over rice. Top with cheese, sour cream, or other toppings. This is from America’s Test Kitchen Healthy book. When you have some calories to burn, this is a very tasty recipe. Follow the directions exactly. I used Idaho potatoes. Add some dried chives or chopped scallions for color, or even parsley, like I did, when I ran out of chives. Be sure to scoop out everything but an 1/8″ of potato for the best flavor. If you leave too much potato in the shell, you will miss some of that creamy incorporated flavor throughout. **Known IC irritants, tread carefully! Omit these and it will still be yummy. Rub potatoes with the oil, place on upper oven rack, and bake until the skins are crisp and deep brown, and a skewer easily pierces the flesh, about 1 hour – after flipping them over halfway through baking. While the potatoes bake, melt the butter in a 10-inch skillet over medium heat. Add onions and cook until softened and lightly browned, 5-7 mins. Stir in garlic and cook until fragrant, about 30 secs. Transfer to a bowl and cover to keep warm. (SINCE I DIDN’T USE RAW ONION AND GARLIC, I JUST MELTED THE BUTTER, ADDED THE GARLIC/ONION POWDER, AND ADDED IT TO THE NEXT STEP). Transfer the potatoes to a wire rack and let cook slightly, about 10 mins. Increase the oven temp to 500° F.
Cut each potato in half lengthwise through the narrow curved side. Using an oven mitt to hold the hot potato, scoop the flesh from each potato half into a medium bowl, leaving 1/8″ thickness of flesh in each shell. Transfer the shells back to the wire rack. Mash the potato flesh with a potato masher or fork until smooth. Stir in 1/2 cup of the cheddar, sour cream, milk, dry mustard, onion/garlic mixture, 3/4 tsp. salt, and 1/8 tsp. pepper. Spoon the mixture into the potato shells, mounding it slightly at center. Sprinkle with remaining 1/2 cup (or more) of cheddar. 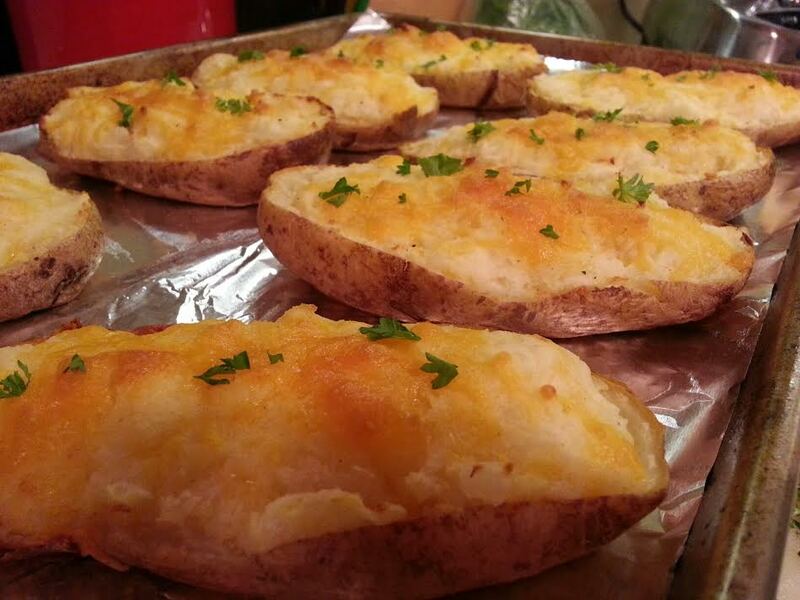 Bake potatoes on middle rack until shells are crisp and the cheese is melted and spotty brown, 10-15 mins. Sprinkle with scallions/parsley/chives and serve. This was one of those magical cooking moments. Don’t ask me why a person, me, who can’t be around raw onion could eat cooked onion rings, but it was great, crispy, and better than a restaurant! My husband cooked these while I was in another room. They were extremely crispy and stayed that way hours later. They were the best I’ve ever tasted. We didn’t have club soda so we used chilled beer, it worked fine. The panko really works here, don’t substitute it! A+! Whisk together flour, cornstarch, dry potato flakes, and cayenne pepper in a large bowl. Whisk in club soda to make a smooth batter. Place panko bread crumbs in a shallow bowl. Place a few onion rings at a time into the bowl of batter and turn to coat all sides with batter. Remove onion rings from batter and place into pan of panko bread crumbs; turn to coat completely with crumbs. 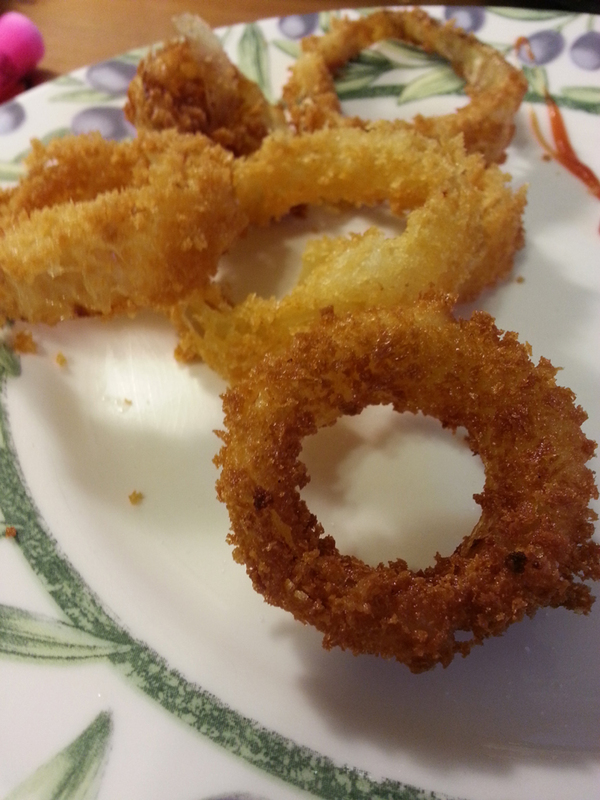 Cook a few rings at a time in the hot oil until golden brown, about 2 to 3 minutes. Transfer to a cooling rack set over paper towels to drain. Season with salt to taste and serve. This is a great cake for a lot of company coming. It makes a lot of batter and a lot of cake. I’ve made it twice and I prefer the dusted version above versus the frosting version I made. The dusted version is a lot simpler and the cake was moister. Definitely use an electric mixer for this, it will uniformly beat it to perfection. I used all orange juice, no water. I didn’t do the streusel. Always use room temp. eggs. Set rack to second-lowest position. 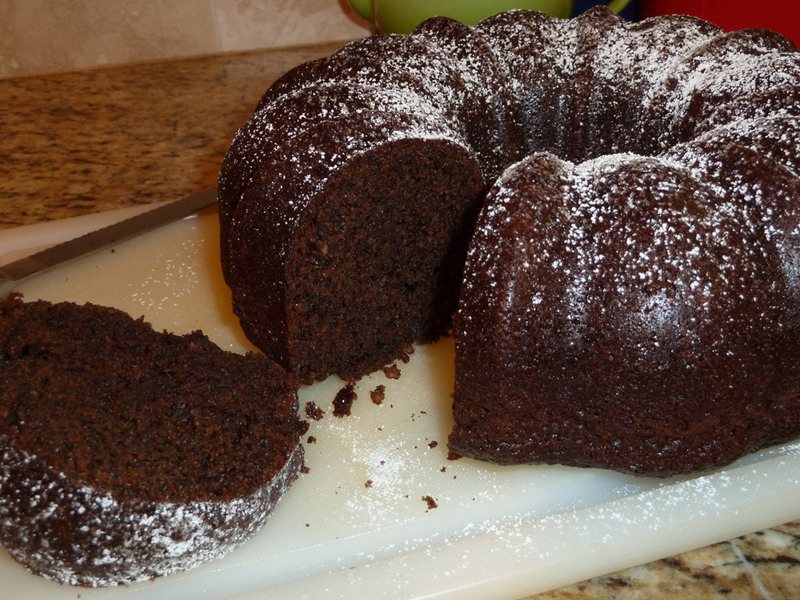 Generously grease and flour a 12-cup bundt pan (I use my Pan Release for this, make certain to well-grease your pan!). In an extra large mixing bowl, combine all the cake ingredients; mix on medium speed of an electric mixer for about 3 minutes or until very well combined. Bake for about 50-60 minutes or until the cake tests done (if using the streusal the cake will take slightly longer to bake). Cool in pan for about 15-20 minutes before removing. Frost or glaze if desired when completely cooled. Optional STREUSAL; this is only optional and may be sprinkled in the middle of the batter, mix together 1/2 cup finely chopped walnuts with 1/4 cup shredded coconut, 1/3 cup brown sugar, 1-1/2 teaspoons cinnamon and 2 tablespoons unsweetened cocoa powder. I saw this recipe and bookmarked it because it has no eggs, a smaller amount of sugar, and got great reviews. It’s from Food.com. I did it completely in the food processor. 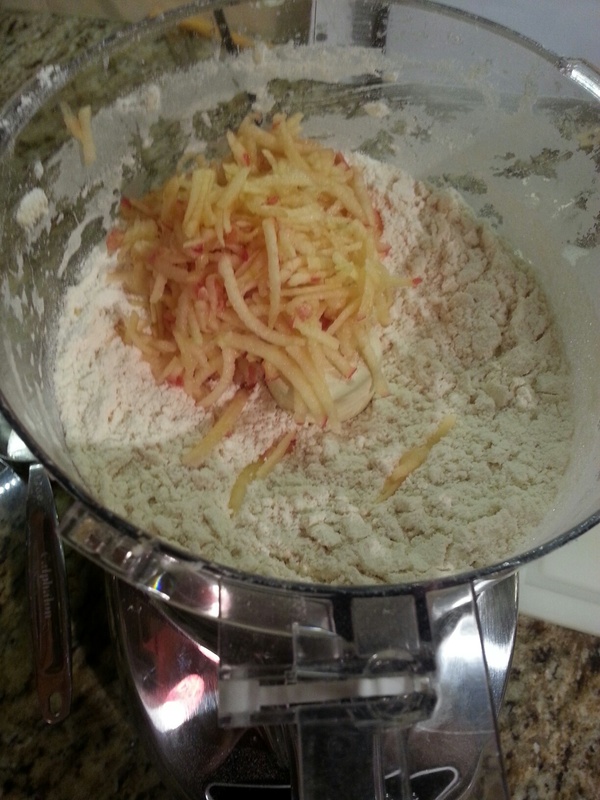 First, I shredded the apple (but only used 1/2 cup), then I removed the shredded apple, and mixed my other ingredients (flour, sugar, baking powder, baking soda, and salt). Then I added back my apple and then put in the milk. I even ‘kneaded’ it in the processor instead of on a cutting board. 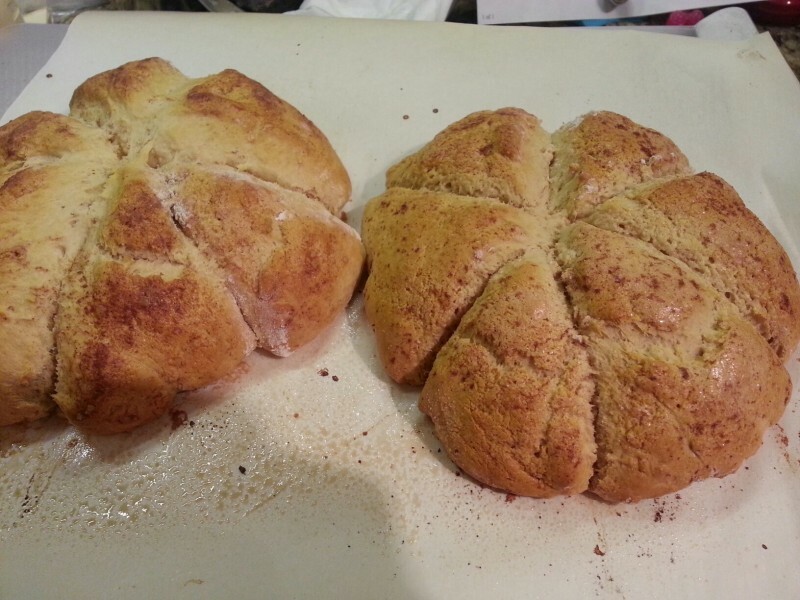 Easy, just a little sticky recipe, so I added more flour and covered it in flour before shaping into a circle. DELICIOUS! Add some butter and preserves, serve with tea! 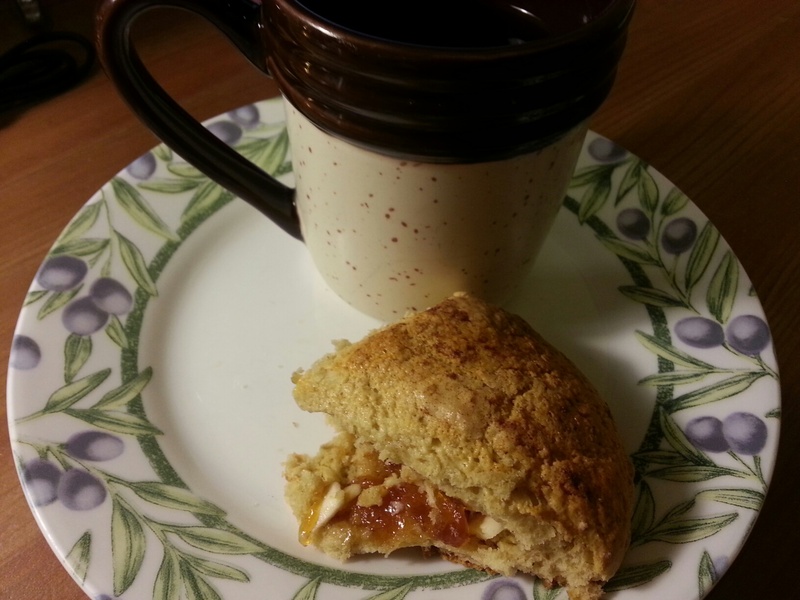 It goes great with Dutch apple preserves! **Known IC irritants, tread carefully! Omit the cinnamon to make it IC safe. Measure flour, sugar, b. powder, soda, and salt into large bowl. Cut in butter until crumbly. Add apple and milk. Stir to form soft dough. Turn out onto lightly floured board; knead gently 8 to 10 times. Pat into two 6-inch circles. Place on greased baking sheet. Brush tops with milk; sprinkle with sugar and cinnamon. Score each top into six pie-shaped wedges. Bake for 15 minutes or until browned and risen. Serve with warm butter and marmalade. Optional: Add 1/2 cup currants to batter. 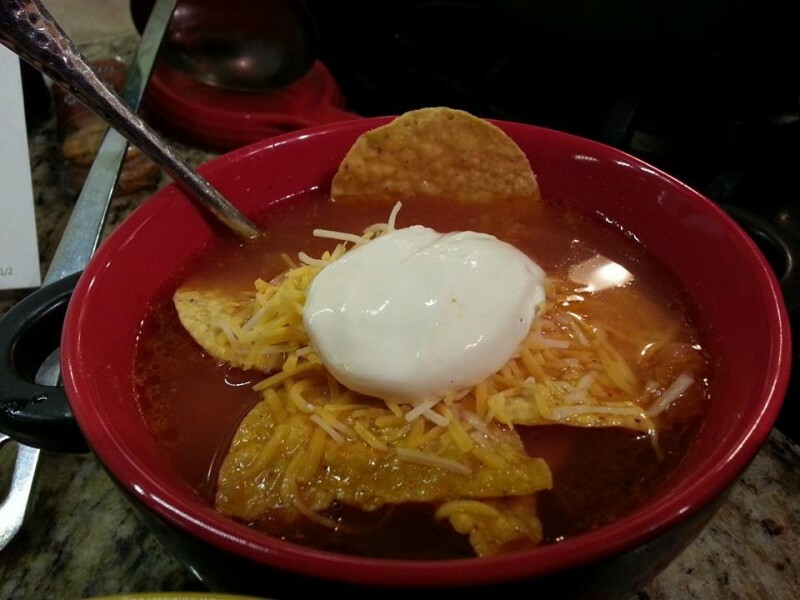 This is a wonderful chicken tortilla soup. I based it off of someone else’s, doubled parts of it, and found the perfect balance of ingredients for me. You can experiment with it! I didn’t give measurements for cheese or chips because c’mon, you can figure that out yourself and make it your own! 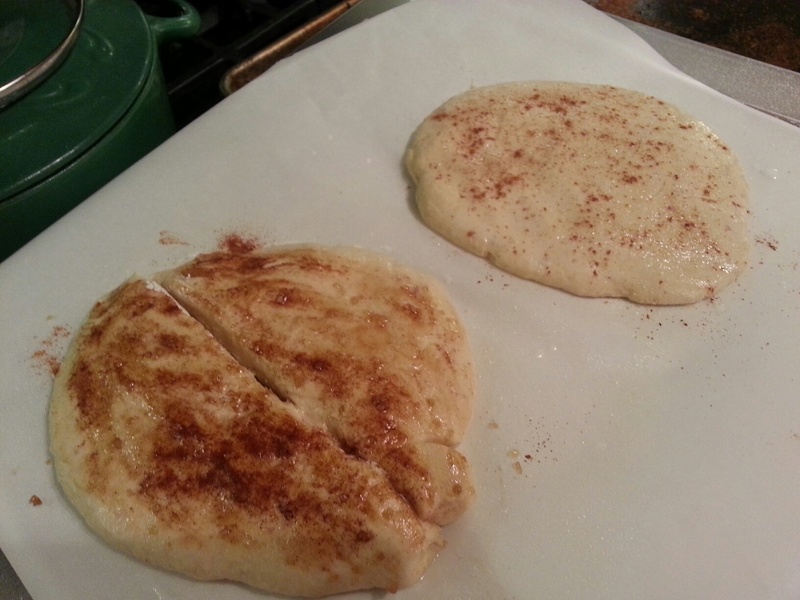 1 large boneless, skinless chicken breast, filleted, and cut into small chunks. In a large pot over medium heat, saute the chicken in the oil for 5 minutes. Add the garlic and cumin and mix well. Then add the broth, corn, onion, chili powder, lemon juice, and salsa. 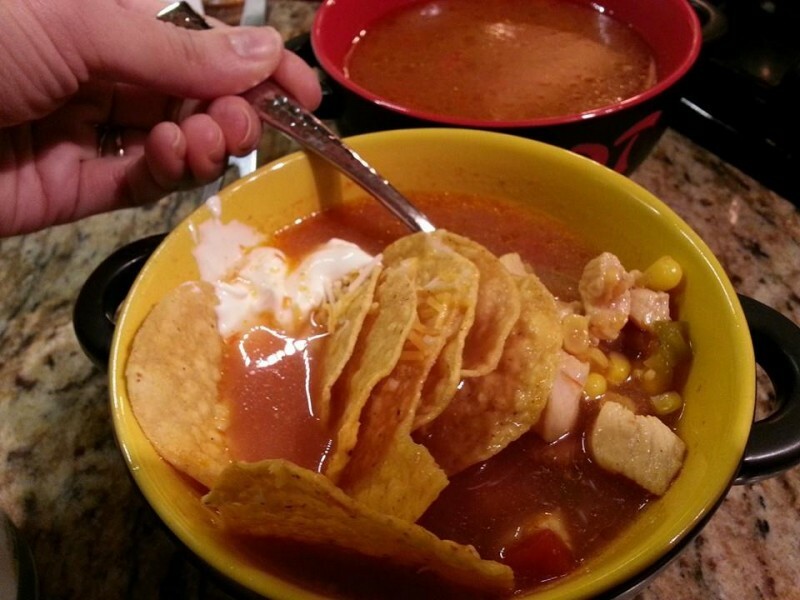 Break up some tortilla chips into bowls and pour soup over chips. Top with the cheese, sour cream, scallions, and whatever other toppings you desire.